Is Zero Leaks possible? It certainly is, and here is the evidence. In the containment industry, there is a long-standing notion about leaks in liner systems: Expect them; leaks are an unfortunate reality that you just can’t avoid. In fact, the term “acceptable leakage rates (ALR)” has become part of the industry nomenclature. We have made the presence of leaks an industry standard. For instance, in 2009, a study performed by Robert M. Koerner and Jamie R. Koerner revealed that acceptable leakage rates ranged from 13 gallons-per-acre-per day (gpad) to 6800 gpad, varying by state, purpose of the impoundment, and governing agency. Since 2009, there have been continuous discussions and publications on finding an achievable ALR. The fact is that during the time of these studies, a Zero Leak impoundment was in the process of being built! And, not just any impoundment – 493 acres to be exact! Can Zero Leaks actually be accomplished? If so, can it be accomplished within budget? Can Zero Leaks only be accomplished in optimal climate and working conditions? Okay, so a project may be leak-free when built, but will it be leak-free tomorrow? First, some background on leakage rates and the PVNGS. According to studies by B. Forget, A.L. Rollin and T. Jacquelin, a typical geosynthetics installation will have a leak rate ranging from an average of only 4 leaks per hectare (2.47 acres) when employing rigorous CQA, to an average of 22 leaks per hectare without CQA. The table below shows what would have been expected on the PVNGS installation and what was actually achieved. The Palo Verde Nuclear Generating Station (PVNGS) located in the Sonoran Desert, approximately 50 miles west of Phoenix, Arizona, is the largest power producer in the United States. The facility, which features a 136-million-square-foot geosynthetics installation, provides electricity to Arizona, California, Texas, and New Mexico, and is the only nuclear plant in the world that is not adjacent to a body of water such as a river, lake, or ocean. The plant receives approximately 70-90 million gallons of treated wastewater per day from Phoenix, which is stored and further treated on site at the Water Reclamation Facility (WRF). Once the operational water has been cycled through the system and has reached its usage lifetime, it is pumped to the evaporation ponds beneath the intense Arizona sun. The operational WRF containment units are comprised of two geosynthetic-lined reservoirs that are 45 acres and 85 acres in size, and three evaporation ponds that comprise approximately 650 geosynthetic-lined acres. From the conception of the project, Shabbir Pittalwala approached the project as that of being a corporate asset, that if properly constructed, would provide a significant return-on-investment (ROI). For Shabbir, this meant setting goals far beyond the regulatory ALR of 550 gpad. What Shabbir realized is that a leak is costly. Not only are the dewatering costs borne by the owner; the inability to process water can impact operations to the point of having to shut down reactors. 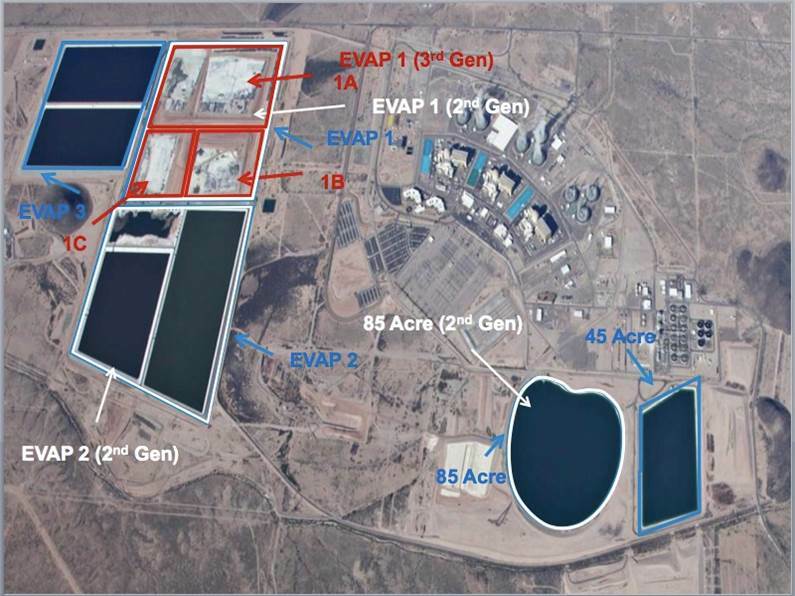 As an example, at the Palo VerdeNuclear Generation Station facility, evaporation pond 2A (117 acre footprint or .4735km2) at full capacity would need to remove 780 million gallons of water and sludge just to make one repair‚ a process that would take 120 days. Not only is the direct cost of dewatering the pond potentially bore solely by the owner, the cost of impacting operations such as lost plant efficiency, lost storage capacity, and lost ability to generate revenue may be as well. In addition, on any facility, there will be time to not only find the leak, but also get it properly repaired, and the facility put back into service. This can be greatly compounded if there are multiple leaks in multiple locations. In the Palo Verde example, the dewatering process for a pond this size would cost approximately 4% of the total construction cost for the pond. It was important to the owner’s bottom line that the ponds be constructed to the highest integrity possible. This mentality governed all the decisions associated with the project and laid the foundation for success. The owner was actively involved in all aspects of the project, from design through completion of construction. The asset mentality can be illustrated not only by using state-of-the-art design, but also in using some of the best available technologies and materials available at the time of construction. Additionally, the owner took lessons learned from the geosynthetics industry, including previous project endeavors, and applied them to the current project. Using wider geomembrane rolls to reduce the amount of junctions and fusion seaming. Using conductive backed geomembrane in conjunction with mandatory bare geomembrane electrical leak location survey (spark test method). The installer completed the project using only fusion welds for primary seams. Repairs greater than 10′ in length were fusion welded. The CQA firm reviewed guidelines and specifications from earlier reservoir construction to compile the most stringent specifications. The CQA firm was required to be present for trial-seam observation, as well as a minimum of one peel coupon and one shear coupon from each installer field pretest of seam-destructive samples. Utilized flexibility in destructive testing to target suspect fusion seams, while minimizing liner penetrations, keeping samples out of high stress areas and still meeting the 1 per 500′ requirement. Obtaining extrusion destructive samples on repairs on a regular basis. Requiring end coupons to be obtained during fusion welding. A retest program was implemented where four (4) previously tested repairs per shift were required to be retested using the spark test and vacuum test as a double check for leaks, in the presence of CQA personnel. Daily tailgate meetings were performed and attended by all installation personnel (including supervisors not working in the area), all CQA field personnel, and owner’s representatives. These tailgate meetings focused on safety, setting the installation agenda for the upcoming shift, corrective measures based on previous shift observations, and any other details relative to a safely producing quality installation throughout the shift. All construction parties were required to attend weekly progress meetings held by the owner. This included the field supervisor for installation and CQA teams. An approach where the pace of construction was dictated by safety. The owner was willing to stop work for as long as needed if quality goals were not being achieved, in order to find and implement resolutions before resuming work. Managing the project in an arid, desert environment where liner sheet temperatures exceed 110oF for over six months of the year, resulting in night shift work performed for that duration. Additionally, wind posed a unique challenge on this project with several haboobs hitting the site during the construction period. Safely meeting the owners’ deadlines. The installer adjusted crew size as necessary and occasionally utilized over 40 personnel during installation processes, running 10-hour shifts, 6 days per week. The owner maintained limitations on work hours for all field personnel that could not be exceeded. A core CQA staff was maintained with personnel having substantial field experience. Supplemental technicians were brought in as necessary, intensively trained by experienced CQA personnel and continuously monitored throughout the project. CQA personnel were only given responsibilities commensurate with their experience level – only the senior QA personnel made critical decisions. Obtaining quality that will last for the design lifetime of 20 years. Using all of the aforementioned factors, including bare geomembrane leak location surveys, stringent peer checking and quality monitoring by the installer, and rigorous pro-active CQA, the team produced not only an installation that was leak free upon initial fill-up, but has remained leak free through the time of this writing (some ponds in use already for 5 plus years). ZERO LEAKS. ON TIME. UNDER BUDGET. 493 acres was installed with ZERO LEAKS, as confirmed by a state-of-the-art leak detection system. At the time of the writing of this study (2016), the ponds remain leak-free. Zero leaks for the long-term is achievable using today’s technologies. The process used at PVNGS is repeatable throughout various market sectors. Success with a vision and is ensured through pro-active management strategies. Yes. The aforementioned project at PVNGS, which ran from 2009-2013, yielded 493 acres of double-containment zero-leak geomembrane. That is not a typo; a project comprising 493 acres was actually completed with ZERO LEAKS! Yes. While it’s true that quality is not cheap, it is certainly less expensive than extensive re-work and repairs. The PVNGS projects were completed within established budgets and ahead of schedule. The key to this success was detailed, itemized estimates and schedules, followed by risk-informed budgets. Requiring geotextile seams to be fusion welded rather than sewn when geotextile was used. Committing resources to having a highly experienced on-site project manager involved on a daily basis for each construction shift. The conditions at PVNGS were no walk on the beach. Since summer temperatures in the desert often exceed 110° F, much of the installation was done at night, adding to the project complexity. Overnight crews—as many as 40 personnel onsite at once—worked 6-day weeks for 11 months. In addition to the heat, there were constant high winds. Multiple haboobs blew through the jobsite. Not only was the installation accomplished in a challenging climate, it was also done with stringent regulatory oversight, as nuclear power is among the most regulated and closely-monitored industries in the world. Leak-free is hardly a good return on investment if it doesn’t last. A properly-installed liner system should deliver that return over the expected life of the asset. On the PVNGS project, the first pond was completed in 2010. Today, all are leak-free. The Zero Leak liner system installed at the Palo Verde Nuclear Generating Station was not the result of randomness or good fortune—it is due the diligence of the entire team, starting with the owner who had a vision, and imparted standards and expectations to the designer engineer, installer and CQA team, who then made a commitment to delivering the best possible product, on time and on budget. Zero Leaks is possible. It’s time to make it an expectation.